Kieran Dunbar scored the Leamington winner. September and October may have proved slim pickings for Leamington, but they are certainly making up for it in the month of November, writes Paul Edwards. A third consecutive National League North win is making this a very productive month for Paul Holleran’s men who had to withstand a great deal of pressure both before and after Jack Edwards headed the opener, before responding superbly to conceding an equaliser with ten minutes to go by scoring the winner almost immediately through Kieran Dunbar. The manager stuck with the same XI that had performed so admirably against Chester on Saturday and once again they did not let him down. The opening half hour was controlled mainly by Billy Heath’s side, who went close through Callum Chettle before the same player saw his cross blocked by James Mace following some smart build-up play, the ball rolling nicely for Nathan Hotte to strike towards goal only for Junior English to clear off the line. Set-pieces at either end were always likely to play a large part in this game, with both sides’ strengths from dead-ball situations always in evidence. However, a string of corners and a free-kicks for the hosts failed to pay dividends, Chettle firing the closest effort just past the left-hand post. Both sides had muted claims for a penalty in the opening exchanges that were waved away by referee Samuel Barrott. Edwards then headed Brakes’ first opportunity of the game over the bar just past the half-hour mark following a corner given away by Martin Riley. The stats were not kind to Leamington as half-time approached but they mean little if they do not lead to goals and it was Edwards who took advantage of a superb free-kick delivery from Reece Flanagan to steal in front of Reds keeper Sam Ramsbottom and head into the net three minutes before the break. Alfreton emerged from the dressing room on the front foot as they searched for an early leveller, dangerman Chettle sending an inviting ball across the face of goal with nobody to finish it off. Again there were plenty of free-kicks for both sides, Flanagan firing one wide for Leamington, while Dunbar was played in behind the Alfreton defence only to see Ramsbottom save with his legs. Tony Breeden dominated his penalty area as time began to tick away for the hosts, moving sharply off his line to collect the ball as it was knocked on to substitute Richard Peniket before confidently collecting a corner kick. Chettle curled another shot wide of the upright as Alfreton turned up the heat and, after English headed yet another free-kick behind for a corner, they scored a deserved equaliser, skipper Luke Shiels giving Breeden no chance as he connected with a powerful header into the far corner. The hosts were hit with a sucker punch less than two minutes later, the outstanding Connor Taylor piercing the Reds defence with a perfect through ball for Dunbar to tear on to and finish low under Ramsbottom. 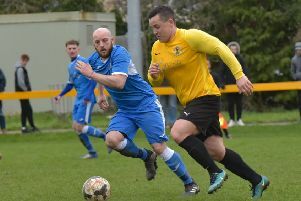 The hosts were unable to muster a serious effort in response in the minutes that remained, Taylor going close to a third Leamington goal when he cut inside from the left and crashed a shot wide. Brakes have now hoisted themselves eight points from the dreaded drop zone with this victory, their fourth away from home and the way they have responded since being thumped at home by Kidderminster has been hugely impressive. Alfreton Town: Sam Ramsbottom, Josh Clackstone (James Clifton, 54), Josh Wilde, David Lynch (Jordan Sinnott, 77), Martin Riley, Luke Shiels, Callum Chettle, Nathan Hotte, Craig Hobson (Richard Peniket, 59), Curtis Bateson, Tom Allan. Subs not used: Tom Nicholson, Tom Platt. Brakes: Tony Breeden, Junior English, Connor Gudger, Reece Flanagan (Joe Clarke, 71), Jamie Hood, James Mace, Kieran Dunbar, Callum Gittings, Colby Bishop (Ahmed Obeng, 84), Jack Edwards, Connor Taylor.Subs not used: James Bowen, Jack Lane, Tom James.